samsAris told AzhwAr “you had asked us to take refuge under thaN thuzhAy mAlai mArban (paramapadhanAthan or SrIvaikuNtanAthan) in the 5th pAsuram. Since we cannot reach his place, you had told us in the 7th pAsuram that silayinAl ilangai seRRa dhEvanE dhEvan AvAn (the one who destroyed lankA, SrI rAma, is the supreme lord). In the 9th, previous, pAsuram, you had told us kaRRinam mEyththa endhai is krishNa himself, a simple person and asked us to fall at the exalted feet of krishNa. For us, born much after the two incarnations, it is equally difficult to attain SrI rAma and krishNa”. AzhwAr responds to them through this pAsuram, saying “due to differences in place and time, it is not possible to attain paravAsudhEvan (who is in SrIvaikuNtam) and SrI rAma or krishNa. But it is very easy for you all to attain periya perumAL (the mUlavar) who is lying in thiruvarangam. Come and surrender to him. Attaining some other deity to reach mOksham (SrIvaikuNtam) is similar to a person, who is longing for wealth, to wait at the door of mUdhEvi (the Goddess of penury)” First let us enjoy the pAsuram and its meaning. சேட்டை தன் மடிய கத்துச் செல்வம் பார்த்திருக்கின்றீரே. kEttIrE – did you hear this meaning? nAttinAn – empeumAn’s devotees, being endowed with more of sathva guNam (quality of being purely good) would take refuge under him due to the knowledge born out of such sathva guNam. But those who are endowed more with rajO guNam (quality of being passionate/ill tempered etc) and thamO guNam (quality of being ignorant, lazy etc), lacking in such knowledge that is given by sathva guNam will not come directly to emperumAn. Instead of letting them to get engrossed in worldly pleasures fully due to their independence, emperumAn decides to make them approach deities with rAjasa and thAmasa qualities initially. Over a period of time, with awakening of their sAthvika knowledge, these samsAris would know about the auspicious qualities of emperumAn and take refuge under him. It is for this reason that he deployed many deities. nAttinAn means deployed. Another meaning is that being the inner soul of these deities, he established these deities. The subtle meaning here is that without emperumAn, these deities will be like creeper plants without the supporting pole. Just as bean plant needs a short stick initially when it is growing and later on a full-fledged network of sticks, samsAris with rAjasa and thAmasa qualities need the support of other deities initially and once they develop themselves they can latch on to emperumAn who acts like an arbour (pandhal). 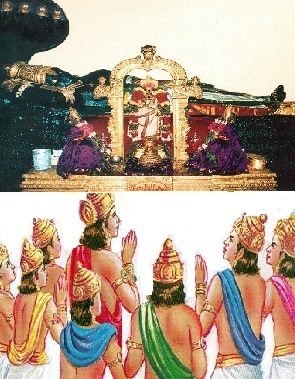 nammAzhwAr says in thiruvAimozhi 5.2.8 “niRuththinAn dheyvangaLAga” – deployed as deities. dheyvam engum – emperumAn created various deities such as ayyan, ezhumUrthty, sapthakannigaigaL, pidAri et al so that samsAris with various qualities, and births based on such qualities, right down to chaNdALan (a birth below the 4th varNa) could approach these deities. In mahAbhAtham it says “vishNurAthmA bhagavathObhavasyAmithathEjasa: I thasmAth dhanurjyAsamsargam sa vishEhE mahESwara: II” – vishNu was the indwelling soul of Siva, due to which only Siva was able to tolerate the difficulty in shooting the arrow after drawing the bow. As nammAzhwAr says in thiruvAimozhi 1.1.5 “iRaiyavar avaravar vidhi vazhiyadaiya ninRanarE” – emperumAn, by remaining as the indwelling soul of other deities, enabled the followers of these deities to reach their goals as per their deeds. Thus emperumAn, by his quality of dwelling inside the souls of these deities, enabled them to get name and fame. emperumAn wishes that samsAris should reach him and get liberated. It is due to this superior thought that he deploys the other deities and gives vision (vEdhas) to the samsAris. His expectation is that these samsAris, with the help of vEdhas, would know about the inferiority of the other deities and the supremacy of emperumAn and ultimately come to him. Most of the samsAris, because of the excess of pApa (sins) that they have committed, remain dedicated to these deities, showing indifference to emperumAn, just as a beans creeper, instead of going onto the arbour, remains with the short stick, planted initially to support it, and withers over a period of time. nalladhOr aruL thannAlE – he shows mercy on samsAris so that they will know what is beneficial to them and reach emperumAn. nalladhOr aruL – this is to be seen in three parts: (a) aruL – enabling the samsAris to approach other deities based on their deeds; (b) Or aruL – enabling samsAris to approach him through other deities; (c) nalladhOr aruL – through his causeless mercy, showing himself at thiruvarangam as the path and the goal to be achieved by these samsAris, after seeing their lowly state. Our supreme preceptor, ALavandhAr says in his sthOthra rathnam 58 “aparAdha sahasra bhAjanam pathitham bhIma mahArNavOdharE I agathim SaraNAgatham harE krupayA kEvalam Athma sAthkuru II” – with your causeless mercy, make me as your property – me, who is the embodiment of thousands of evil deeds, who has fallen into the deep ocean called samsAram, who has no other place to go, and who has surrendered unto you. It is this causeless mercy which is showered on samsAris even when they do not realise their lowly state and feel sorry for themselves, that is termed as nalladhOr aruL. Just as he is going to refer to thiruvarangam next because of this mercy, even deploying other deities is due to this mercy, says the AzhwAr. aruL thannAlE kAttinAn thiruvarangam – showed thiruvarangam out of that mercy. Nobody appealed to emperumAn to show them thiruvarangam. Just as a nursing mother will express milk onto the ground due to excessive pain in her breast, emperumAn shows himself up at thiruvarangam as he would otherwise not be able to thrive. Similar to a person presenting a gem with the wrapper, emperumAn presents himself at thiruvarangam temple. To know the difference between the samsAris (and the deities that they take shelter under) and himself, and for them to realise one day that they are protected by emperumAn, he dwells in thiruvarangam permanently. Who did he show himself up to?…..
uybavarkku – emperumAn showed himself at thiruvarangam to all those who wanted to live an exalted life. It is enough if samsAris do not think that they will not take shelter under him. Since this is the way to live properly, taking shelter under other deities will only bind the samsAris to the samsAram is the meaning emphasised here. uyyum vaNNam – To worship emperumAn who is antharyAmi (inner dwelling soul) of other deities through karma (deeds) and upAsana (bhakthi or devotion) is one way of attaining mOksha (liberation) for samsAris. But this path is defined only for samsAris born in the first three varNas (brAhmaNa, kshathriya and vaiSya). Going to thiruvarangam and taking refuge under emperumAn as both the path and the benefit is common to all samsAris irrespective of varNa. kEttIrE nambImIrgAL – AzhwAr is asking those samsAris who, forgetting emperumAn, are feeling fully satisfied after their involvement in worldly matters “will you listen to what I am saying now?”. Another meaning to this term is that AzhwAr is asking these samsAris “when emperumAn is around, forgetting him, you people are going after other deities and feeling fully satisfied. Will you now listen to what I am saying?” When people are playing chathurangam (a variant of modern day chess) they will be so involved in the game that they will not look at other things. In the same way, the samsAris, forgetting emperumAn, are busy in worldly matters and other deities. AzhwAr is awakening them by tapping them on their thighs. gerudavAgananum niRka – emperumAn who is having garuda, considered as vEdhasvarUpan (epitome of vEdhas), as his vehicle is the supreme entity to be reached. Sitting majestically astride garuda, tirelessly holding the discus (sudharSana chakram), having lakshmi, the Goddess of all auspicious things – possessing even one of these three features would identify emperumAn. gerudavAgananum niRka – he urges garuda to take him immediately to anyone who shows even a little bit of affection. Since AzhwAr says “niRka” it shows that he is eagerly waiting for samsAris to get involved with him, similar to how sumanthra, the minister in dhaSaratha chakravarthy’s court was waiting for rAma at the banks of gangA “ASaya yadhi vA rAma...”. Another interpretation is that this indicates that when samsAris reach out to other deities, they have to go past him even as he is waiting close by for them. chEttaithan madiyagaththuch chelvam pArththu irukkinRIRE – you samsAris are waiting to get money from mUdhEvi (deity for penury). Expecting mOksham (SrIvaikuNtam) from other deities is similar to expecting money from mUdhEvi. Is it possible to obtain mOksham (from which there is no returning to samsAram) from deities who can offer only lowly benefits, and which bind the samsAris further to samsAram? Begging for dress from a person who himself is not wearing anything is equivalent to killing him. In the same way, asking for mOksham from other deities will lower their esteem. How can one get mOksham, which is reachable only by a person with sathva (purely good) qualities, from deities who are immersed in rajO and thamO qualities (passion and ignorance respectively)? Is it proper to call deities which have knowledge and strength as mUdhEvi? The answer is that a chakravarthy’s (emperor’s) wife and children will not bother about his servants. In the same way, those who have taken refuge under emperumAn will not value other deities. It is pertinent here to remember that thirumazhisai AzhwAr continued to stitch his vEshti (dhOthi, lower body cloth) even after rudhra and pArvathi were waiting to bless him and grant him boon. We shall move on to pAsuram 11. This entry was posted in Other on September 1, 2016 by T N Krishnan.